For the #vinylandfood supper club this Sunday I made a classic French dessert, developed originally by the great 19th century chef Escoffier. I couldn’t believe how good it was, the simplicity of poached pears, chocolate sauce and vanilla icecream. Times like these, I regret never having been formally trained in cookery, which means that I’ve skipped over classic dishes. We strain for originality and new worldwide influences but delving into the roots of European cookery can yield flavour combinations that we ignore at a cost. It’s like ballet, you can only become a good modern dancer if you’ve studied classic dance. 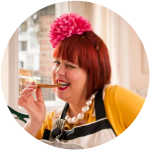 Yes this is my ‘back to basics’ conservative cuisine post. So, Poires Belle Helene (named after an opera), how to make it? 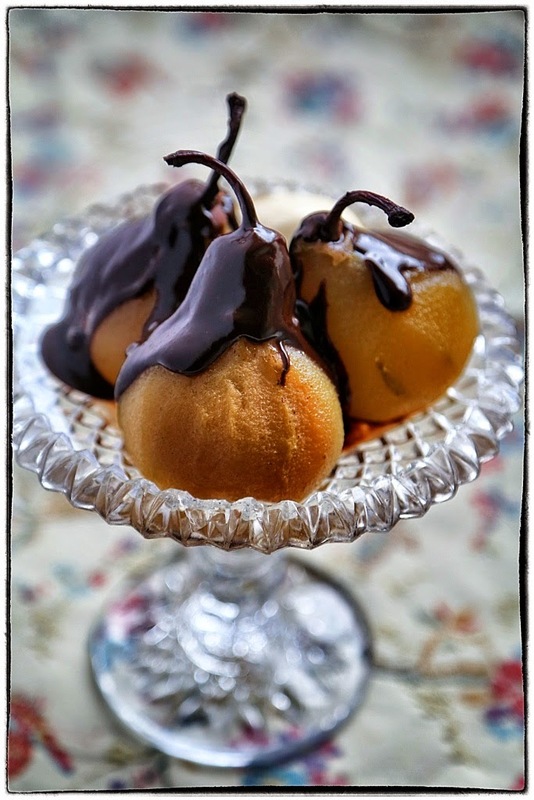 The recipe is fairly easy and effortless, but on Sunday, never having made it before, I assumed that pouring the chocolate sauce over the pears, just like you see in Google images and on Pinterest, would result in the tear-shaped fruit glistening with a smooth artfully dripping chocolate sauce. Wrong. 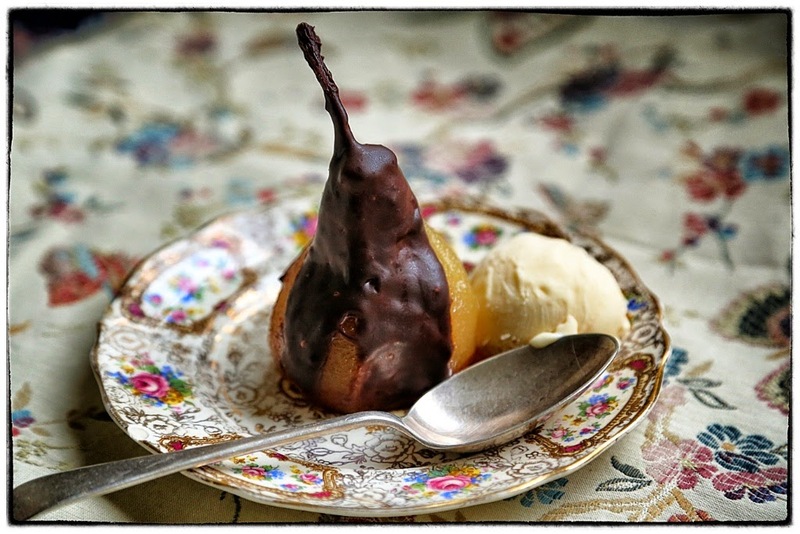 Chocolate sauce will not stick to wet poached pears. Although it tasted great, it looked like a hot mess of unglossy congealed chocolate and slippery pears lurching on their sides like little drunks. So I spent Monday trying to figure out how to do it with elegance. After some pfaffing about with icing sugar, (will this get the chocolate to stick? answer: no) I came up with some solutions. To get the sauce on top of the pears, you need to a) make sure the chocolate sauce is liquid and warm enough to flow b) cut off a sliver from the bottom of the pear so that it will stand up straight c) chill the pears d) have a dab hand with a spoon resulting in beautiful drips e) put the end result in the fridge straight away for the chocolate to set. The problem with the chilling is that suddenly you don’t have the warm pears/hot sauce/cold icecream triumvirate of triumphantly matched tastes, textures and temperatures. You can à la Delia, or like Poires au chocolat, pool the sauce at the bottom of the pears. Is that cheating? If any ‘proper’ chefs know any more tricks, do let me know in the comments. For the chocolate sauce, I melted the chocolate pieces over a ‘bain-marie’, that is a bowl over a pan of hot water (or over the pan reducing the poaching liquid). It’s important that the bowl doesn’t touch the water. Or, you can melt chocolate in a micro-wave, in 30 second bursts. Once melted, add some of the poaching liquid and whisk until glossy. 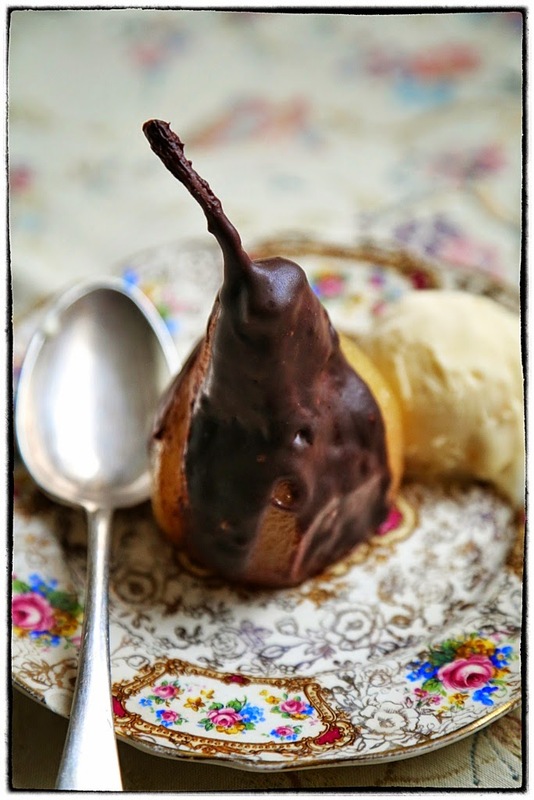 (You can also add a few tablespoons of single cream, for a ganache, or a pear liqueur. I actually used some bay leaf liqueur I bought in Italy, I love bay). For the icecream, make the custard by putting the milk, sugar, vanilla and salt into a medium saucepan on a low heat and heating until amalgamated. Whisk the egg yolks in a bowl then temper them by adding a few spoonfuls of the warm cream into the yolks, mixing well, then pouring the egg mixture into the saucepan with the cream. Keep stirring with a wooden spoon until it achieves a custard like consistency, that is, you can run a finger down the back of the spoon and it leaves a bare wooden streak on the spoon. Then take off the heat and allow the custard to cool for a few hours. Once cool, whisk in the creme fraiche. Then pour the lot into your icecream maker and follow the manufacturers instructions. I now have a Cuisinart icecream maker which costs a couple of hundred quid, but I have to say, life is a whole lot better as a result. Making fresh icecream is now a cinch. In general, after the custard has cooled, it takes 45 to 60 minutes and has a superb scooping consistency. I start making the icecream just before guests arrive. I've seen one recipe with honey in the chocolate sauce – in addition to cream and chocolate – maybe that's what makes it stick. I would mind a pool of it at the bottom personally. It seems both you and Lavendercooks are suggesting adding an invert sugar to the chocolate. I find a chocolate glaze made with butter, chocolate and a little glucose infinitely more forgiving than ganache made with chocolate and cream. It is shinier, runnier, sets more slowly and doesn't seize up in quite the same way. I use it to finish cakes over a firm layer of ganache when I want them really shiny. Though when using chocolate and cream; single cream and chocolate with a lower cocoa solids content like 54% is easier to work with than 72% chocolate and double cream which I see often in recipes. I have never made anything like the above either but it sounds wonderful and Packham pears are very good at our grocers at the moment! I absolutely love it, I'm a total icecream freak anyway.